It would seem Digimon Fusion has stumbled upon two ways to make the good old “they're not just data” chestnut fresh and interesting. One way is to stop limiting it to just Digimon. Let Ewan believe that Mikey too is just data, and so is he for that matter. Heck, exclude the Digimon entirely and just have the fight between the two generals. It's more fun when Mikey has to give this speech while trying not to get sworded through the heart. The other way to shatter the fantasy- actual pain. On Ewan, on Mikey, on Tuwarmon... let's get everybody messed up and see who still thinks it's fake! Before breaking Ewan, however, Mikey has to figure out how he's broken. He learns the truth through a lot of talking and a lot of swordfighting (which falls under the logic of The Marcus Code), but it makes you wonder what Mikey thought of him before. Delusional? Deranged? Some twisted monster? Mikey will try to talk it out no matter what, but it isn't until the fighting begins that he realizes that Ewan's not actually bad. On the contrary, he's actually very good. Too good, in fact. Ewan's problem is that he can't handle suffering of any kind. He's too compassionate, possibly without conditions. Unable to handle any sort of pain being inflicted on any living creature makes living in reality impossible. So he doesn't, leaping at the first promise of a carefree world. Realizing this helps Mikey figure out his approach, and it's a damn good one. He fights back enough to destroy Ewan's weapon and minimize any damage to him, then he inflicts some real and honest pain. Then he throws down the big speech, a grittier version than what we usually hear involving all the little cuts that the kids sustain in these adventures that nobody ever thinks about. It's a real eye-opener and the mission would be accomplished if Ewan wasn't so human. Everything's sitting there in front of him. Mikey and Nene are holding back for fear of hurting him. AxeKnightmon is doing some pretty nasty things in a pretty nasty place. Even Tuwarmon is beginning to crack. The illusion is shattering in front of him, but the implications are too traumatic for him to bear. If AxeKnightmon is lying, that means that Ewan was a party to unforgivable amounts of pain and death. If AxeKnightmon isn't, then Ewan can still live with himself. Of course he's going to be in denial. And of course he's going to throw everything he has into defeating Mikey. The incredibly manic face as his sanity slips away is just a bonus. It's not the only thing going on; the many smaller battles happening simultaneously is one of the great treasures of this string of episodes. At the same time, Ewan's story is so overwhelming that the stuff with everybody else feels thrown in. 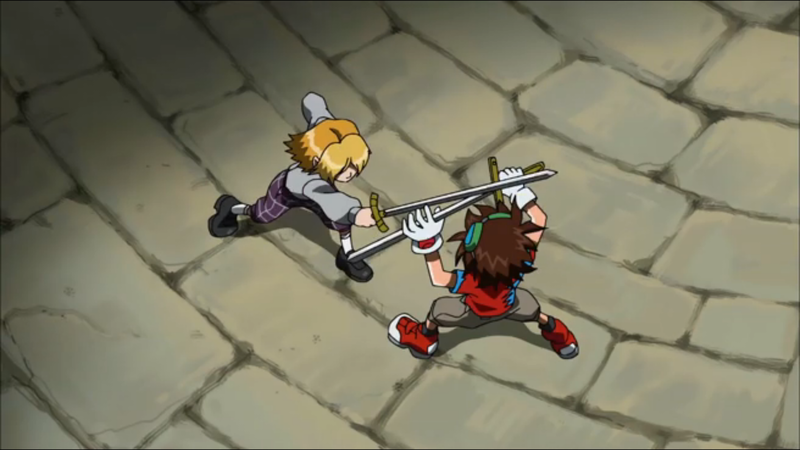 Most of the episode is spent with the possibility that Christopher didn't survive the fight with Apollomon Whispered, but there's no angst to be found, just a mild cheer from Mikey when he turns out to be fine at the end. Against SkullKnightmon, Nene pulls one of the great moves of the season, quietly pulling Sparrowmon off Shoutmon X5 in order to get in a sneak attack. With so much of Twilight retreating to help Ewan, this really halts all of the momentum the bad guys had. 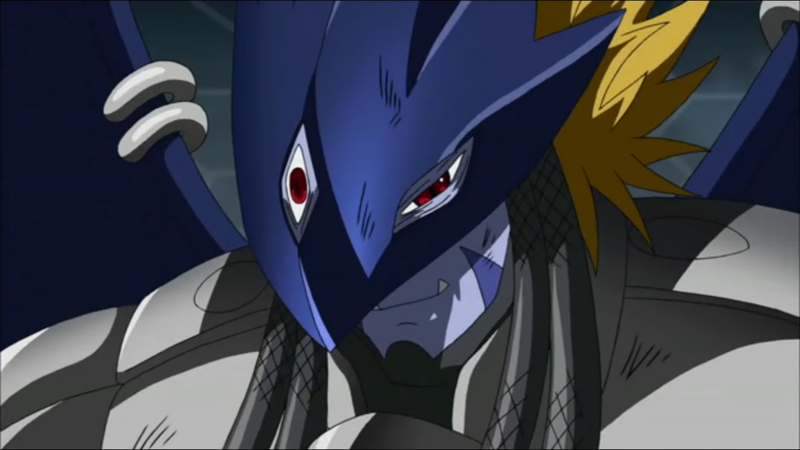 ...and then there's Beelzemon. We all knew he had a proper character arc and with Laylamon thrown back into the mix this is the time to resolve it. But his screen time had been lacking in episodes past and it's clear he's playing catch-up. We needed the reminder that he had a million reasons to take Laylamon out. His sudden love-hate relationship with HiTsundereMervamon came out of nowhere, a shame because it's delightful and rare, and really needed a few more episodes to establish. While we see precious little of what transpired, he comprises one of the important bookends that ends the episode: he and Tuwarmon are both dying. So much of Tuwarmon's confidence comes in Ewan being willing to kill Mikey but not vice versa. Between his reaction to Mikey seemingly getting that killer instinct, facing the wrath of Shoutmon X7 and having to lie about his injury, he's having a really bad day. Ewan says he will defeat Mikey, then have cake. That has to be a Portal reference, right? AxeKnightmon obviously promised that after Mikey's dead, there will be cake and grief counseling. We all know how that ends up. Along with the lack of drama over whether Christopher is alive, there should be doubts over whether MetalGreymon is alive after the attack from Apollomon Whispered, but again- no angst. Somewhere in all of this, we even get a proper resolution of Nene's past with AxeKnightmon. If not for Nene's move with Sparrowmon, it's pretty forgettable. That's how much happens here. Its so rare to see sincere by-the-book romantic tension between two characters that isn't played for laughs. And between two Digimon? Where has this been all season? 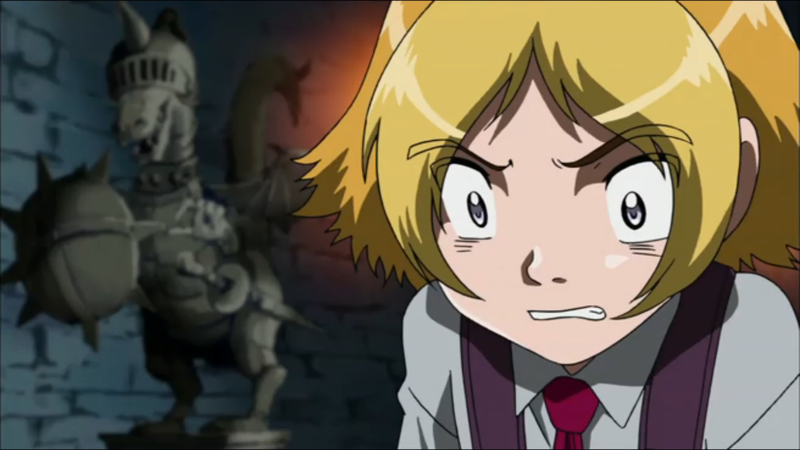 Boy, that reaction when he realizes that all the parts to create Shoutmon X7 are standing in front of him. He just knows he's in trouble.